Pesto is typically made with fresh basil as the main ingredient (and you need a lot of it). I find buying the amount of basil that I need to be cost prohibitive. If I get it together and plant a garden, I will make basil pesto until the cows come home, but without a cheap source my pocket book starts screaming. Kale, on the other hand, is inexpensive and plentiful. Also, it is far less delicate than basil and very green. Is this the same as basil pesto? No, but it is a pretty delicious substitute. The kale is grassy and not as pungent as the basil. You can serve this over pasta, as a dip, as a spread for your sandwich and no one has to know you used a superfood as an ingredient. The green color is a dead giveaway, though. I haven’t figured out a way to make pesto without a food processor and every few months I beg all of you to buy yourself one. It makes chopping vegetables and all sorts of food preparation go by in a flash. Julia Child loved hers! If you don’t have pistachios you can use ½ cup of pine nuts and vice versa. You can use any nut that you have on hand (walnuts, almonds, peanuts) – it will simply taste different. I like the buttery flavor of the pistachios in this dish. In a food processor, mince garlic. Wash and rip kale from the stem and add to garlic along with the pistachios and pine nuts. Run machine for about 1 minute until well chopped. Add olive oil, lemon juice, salt, and black pepper. Process until mixture turns into a paste. Pesto will keep fresh in the refrigerator for one week. My basil pesto recipe ratios are different tho, 2c basil, 1/2c parm, 1/2c evoo, 3 med garlic, 1/3c pine nuts. I double this to freeze half in cubes. It spreads beautifully. Also same recipe with parsley. 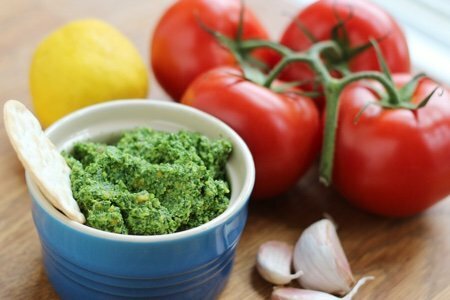 Have you experimented with parm in your kale pesto? OK, I love your blog and your recipes, but kale pesto? There's no way! You know the kale craze has gone too far with the arrival of kale pesto! I'm kind of joking, but kind of not. I like kale as a vegetable, but the texture is part of its (limited) appeal for me. I think the pistachios, garlic, and lemon juice would make this a decent-tasting recipe, but it would be a lot tastier with a more flavorful main ingredient (like basil or cilantro)! I'm not carping in a serious way -- I think the idea of kale pesto is kind of funny. Kale is invading everything! Anyway, I do love your blog. I think I will attempt this recipe with a couple of mods: 1/2 kale and 1/2 basil; almonds/walnuts as they are the better choice for heart heath; what - no parm cheese?! Lol). I have not jumped on the kale bandwagon yet (I know, I know) but this may be a way to start. Thanks for the tip! I will have to try this! I have made pesto with cilantro and basil. It was delicious! One thing I don't understand. You are substituting kale for basil because of the cost, but the recipe calls for pine nuts. In my area, they are $32 per pound. Talk about being cost prohibitive...at least for me. @Kris - but I only use 2 ounces so it cost me about $3 for the pine nuts. Skip the pinenuts and use all pistachios or use walnuts. Thanks for the comment! Such a great idea! I am growing a ton of kale in my garden this year and this is a great way that I can use some of it up. Writing this one down! I like the idea of half kale and half basil or cilantro, and was going to suggest it when I saw Jennifer's comment. I feel bad for joking about it above, and I apologize! It came across sounding nasty, when that wasn't what I intended. Joking on the internet can be tricky! I barely like a hint of fresh basil, so I can't wait to try this with kale instead. I'm a southern girl and have loved kale, (and most other greens) for years. I love kale every way I've tried it so I'm sure this will be delicious! Another good option is arugala (rocket). You can use any pesto recipe and just substitute it for the basil. For several years it came up in our garden as a volunteer so we were trying to find uses for it. Turns out, the pesto was delicious! Love this recipe. I also make pesto using broccoli. Great for my son who for years has never known he was eating broccoli. (And still doesn't). Now kale, even better. Also agree about possible using walnuts or more pistachios for the pine nuts.